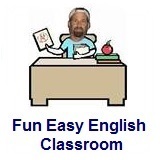 ﻿ Fun Easy English - new classroom free online classes english language lessons speaking listening writing reading december 13. Today in the Fun Easy English classroom you are going to learn "jev" an American English reduction. Did you have a nice day? Jev a lot of guests? Jev a lot of problems? Jev a lot of ideas? Jev is the way "Did you have" sounds when spoken quickly. Try it yourself. 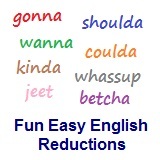 Reductions, such as jev are not real words in English.